Deserted beaches, forest hiking trails, whale-watching opportunities and bohemian communities make this island a popular escape for city dwellers. Vancouver Island is home to both remote wilderness and cosmopolitan cities. This collection of islands off the west of Canada is known as the “final frontier” where adventure meets natural beauty. Journey into rainforests, go scuba diving in sparkling waters and visit cultural attractions dedicated to the people of the First Nations. 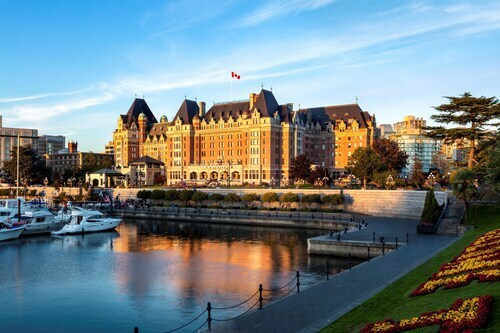 Start in Victoria, the capital of British Columbia on the southern tip of Vancouver Island. Enjoy the daffodils and tulips in Butchart Gardens and take the children to the Victoria Butterfly Gardens to marvel at thousands of tropical butterflies. Climb up the steps at the Craigdarroch Castle Historic House Museum for stunning views across the city. Drive along the Pacific Marine Circle Route to see dense wilderness and rural villages such as Metchosin. 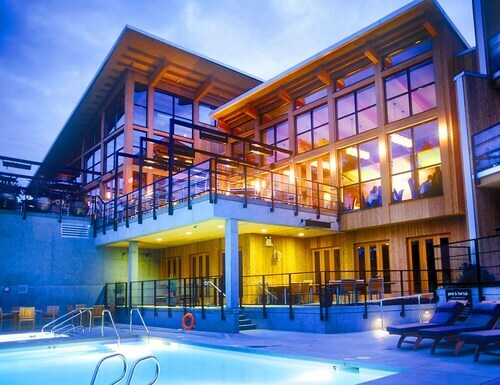 Play in the tidal pools at Port Renfrew and enjoy farm-fresh cuisine in Sooke. Cyclists will enjoy touring the diverse landscape of the Gulf Islands. Be prepared for uphill climbs and rolling country roads. The remote north of Vancouver Island is far wilder and is home to the grizzly bear-filled Great Bear Rainforest. Go on a whale-watching tour with a qualified guide and look for orcas and humpback whales. Water lovers can scuba dive in Quatsino Narrows, while kayakers can visit Echo Bay off Gilford Island for a peaceful day watching seals. First Nations peoples have lived in Vancouver Island for thousands of years and still have a huge influence on local culture. Visit the Alberni Valley Museum to see First Nations artifacts, take a guided First Nation canoe trip down the Campbell River and learn traditional ceremonial dances. Fly into Victoria International Airport to reach the island or take a chartered seaplane to more remote destinations. Ferries are also a popular way to get around. Roads on the island are fully paved and designated scenic routes such as the Oceanside Route or North Island Route will take you through some of the area’s most beautiful scenery. Winter trips to Vancouver Island deliver all manner of cold-weather fun, from skiing to hikes in snowy forests. Experience island life on this Salish Sea archipelago, where you’ll find wineries, artists’ galleries, secluded beaches and protected forest reserves. Marvel at exhibitions of paintings, pottery and jewelry that have been inspired by the beautiful scenery on Vancouver Island. Enjoy a day of outdoor activities among the forests, lake and waterfalls of a scenic park on central Vancouver Island. See waterfalls and colorful rocks as you traverse rivers, bogs, rainforests and beaches in the three distinct sections of this enormous reserve. Stroll along this scenic walking loop at your own pace to enjoy the tranquil ambiance of the forest and the rugged setting of the coastline. Look for wildlife in tidal pools, forests and out to sea when you visit this unspoiled beach on Vancouver Island’s west coast. Venture into a coastal rainforest, stroll along waterside trails and study native and foreign plants at these beautiful botanical gardens. Learn about the region’s human and natural history, visit some of the oldest buildings in the province and see a special collection of totem poles. View a rich collection of marine life, including sea lions and starfish and learn about local biodiversity at this waterfront aquarium. This central street attracts the crowds with its museums and galleries, historical architecture, shopping districts and Canada’s oldest Chinatown. Inhale intoxicating fragrances and marvel at the dazzling colors of these gardens, which host engaging events and family-friendly activities. Mighty, ancient trees cover this Vancouver Island park, which offers walking trails, open-water swimming and the chance to spot wildlife. Geothermally heated waters bubble up through the rocks before tumbling into the sea at one of Vancouver Island’s most remarkable natural attractions. Beneath the crystalline water of a lake lies this network of caverns where adventurous visitors can bravely go on long trips underground. 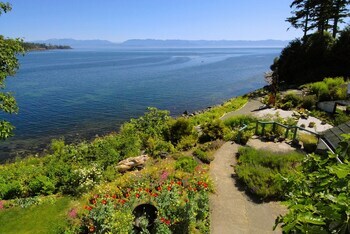 Located in Comox-Strathcona A, this motel is within 3 mi (5 km) of Courtenay and District Museum and Paleontology Centre, Courtenay and District Memorial Outdoor Pool, and I-Hos Gallery. St. Joseph General Hospital and Crown Isle Resort and Golf Community are also within 6 mi (10 km).